John Stimberis leads the way along the ridge north of Denny Mountain. At last year's Snowball Benefit for NWAC, Jim Hirshfield (JimH) and I got into a fierce bidding war to see who would accompany Rob Gibson (Gib) and John Stimberis (Stimbuck) on a cornice control mission at Alpental. After we bid the price up, the sponsors decided to give us both the opportunity to go. Today was the big day. Conditions couldn't have been better. Ten inches of light snow fell overnight and dawn brought broken clouds, sunshine, and beautiful lighting. We met at the ski patrol room at 7 a.m. and were soon on our way up the mountain. The air was cold, but we knew it would warm quickly in the spring sun. John Stimberis traverses the ridge then prepares a six-pound shot. 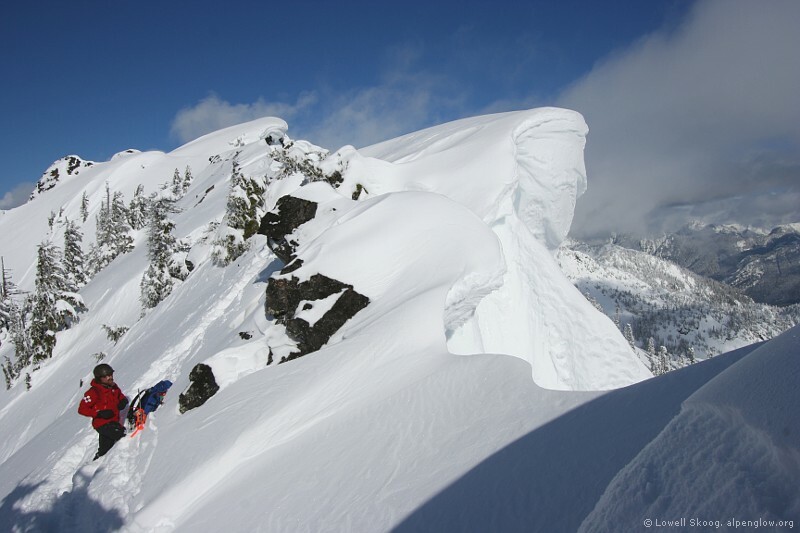 At the top of Chair 2 we split in two pairs.� Gib and Jim headed south, while Stimbuck and I followed Aaron Opp to an airy spot near the top of Denny Mountain.� "Jose's" is a tram used to lower shots into a chute at the skiers' left of Upper International.� Aaron and John cheerfully answered my questions and tolerated my picture-taking as they rigged a bag of explosives and connected it to the wire.� After a tug on the igniter, I pushed the bag out into space and it wizzed down the wire toward the target zone.� Using the retrieve line, John guided the bag to a point near the center of the gully.� The air blast triggered an avalanche that sent a powder cloud to the bottom of Upper International. 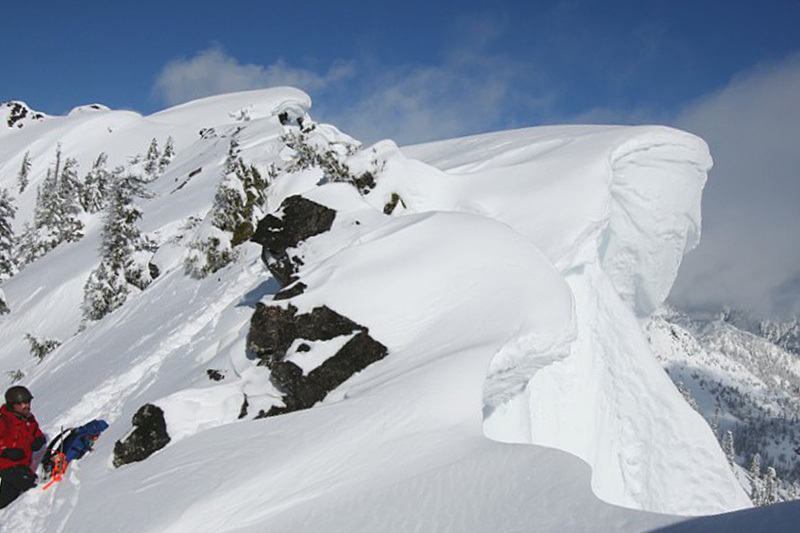 Stimbuck hunts cornices on Denny Mountain. 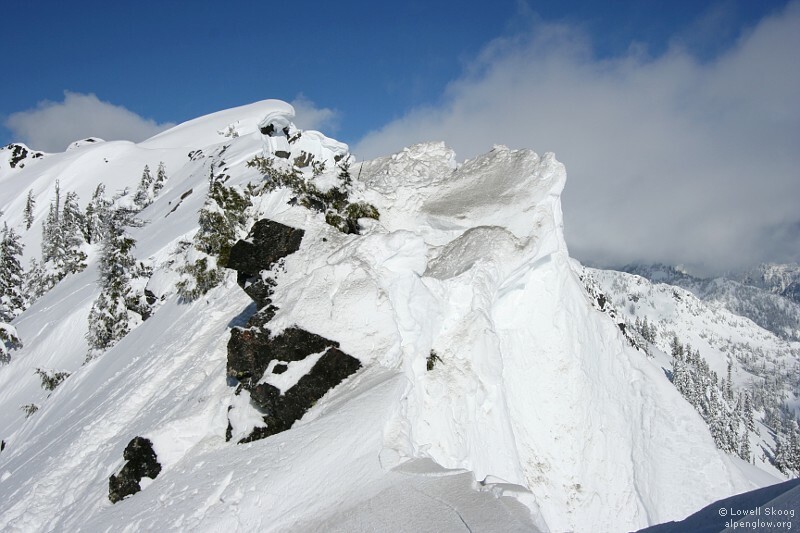 After retrieving the tram sling, John and I climbed to the top of Denny Mountain and began traversing the ridge northward.� We paused at several spots to watch patrollers placing shots at various locations on the mountain.� As we got farther along the ridge, we relied on spotters and radios to help us locate the biggest cornices.� John explained that when the cornices are sturdier, it is necessary to climb to the back of the cornice, dig a hole, and bury a shot to knock it down.� We had a rope and climbing harnesses for this purpose, but they were unnecessary today.� With the big snowfalls recently, the cornices at Alpental are soft and reactive and we needed only to lob a charge onto the surface of the snow to bring them down. 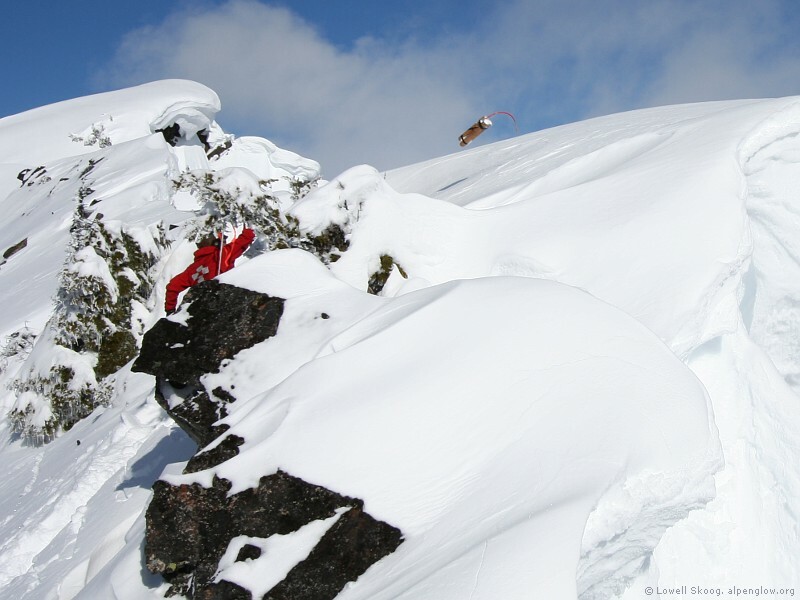 Stimbuck lobs a shot onto a fragile cornice. For most of our shots, John taped together three two-pound Powerex charges.� The shots were rigged with two (redundant) 90-second fuses.� After igniting the fuses we would throw the shot and then scurry down the trail to hide behind a tree.� Covering your ears is mandatory if you want to retain your hearing.� The blast rattles your internal organs, showers snow down your neck from any nearby tree, and sends cracks shooting across the snow as the whole ridge shudders. Aftermath of a cornice shot. Placing the shots was great fun.� The only downside was that we didn't get to watch the cornices we knocked down as they fell.� Fortunately, we made up for this by trading places with Gib and Jim in the afternoon.� As they climbed to the ridge above Piss Pass, we relaxed and watched their handiwork with video cameras ready.� Unfortunately, we both missed recording the most photogenic cornice fall (which pulled out a slab avalanche above the High Traverse) due to photographer error. Although most of our time was spent working, we got in some very nice turns as well.� The skiing was excellent at Alpental today if you stayed on north-facing slopes.� Sunnier slopes got pretty heavy by mid-day.� Overall the Alpental cornice control mission was a great experience, and if they offer this for auction again at Snowball, I heartily recommend it. 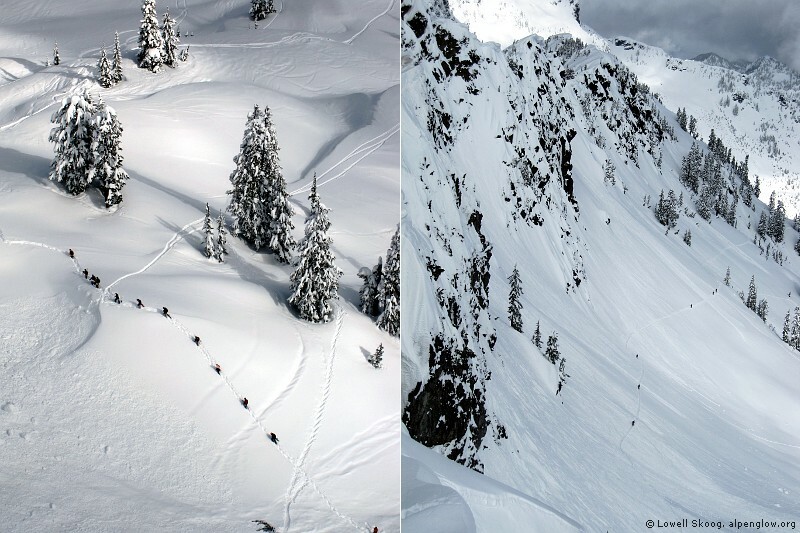 The Alpental backcountry is open! Super photo's Lowell! Priceless mission, glad you got the good day for it with sun and overnight snow. 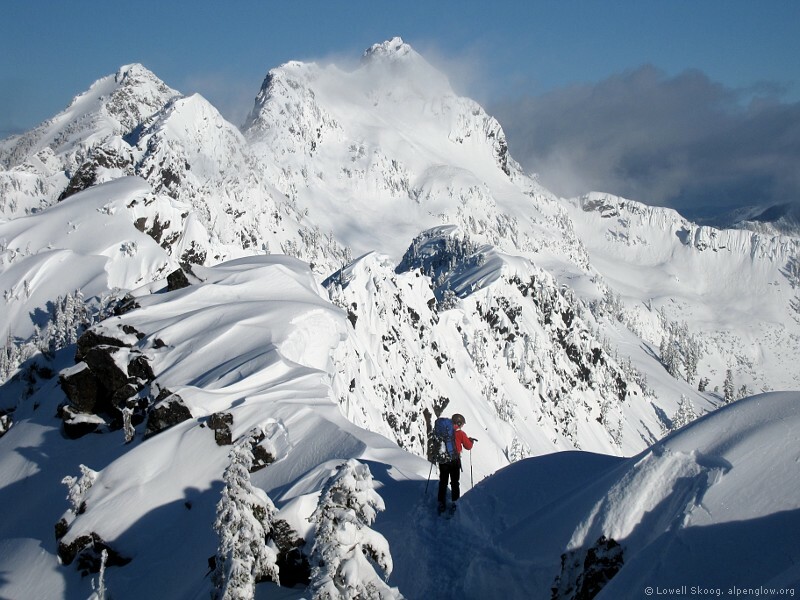 Thanks for sharing a glimpse of what goes on before the backcountry gates open.� A perfect day. Excellent write up Lowell, and + props for bidding up the Mission at the Snow Ball. Nice report, and unique too! The photo of Stimbuck lobbing the charge was taken with roughly the same focal length as the others, but I cropped it to make it easier to see him. With a good eye you can see where he laid the shot. I think we put on a nice show for the customers watching from International. I pulled out my old (2005 vintage) Canon digital SLR for this trip because I wanted wider angle shots than my little point-and-shoot can do. Now I think I need a new camera. The shots out of my pocket camera (Canon SD880 IS) had better detail than the SLR. I imagine that the technology has gotten a lot better in six years, and my old Digital Rebel XT is becoming out of date. Nice report Lowell, and nice job bidding your way there! the boom is nice, but it is a bummer not getting to watch it run. Looks like you had the best day visibility wise! Amar, really like your comparisons of the cornice shots! Lowell - thanks for the great report! I hope to add something soon on the route that Gib and I took, which included a pretty comprehensive tour of daily control work at Alpental. Serves me right for showing up on a day when they had to deal with 10 inches of new. 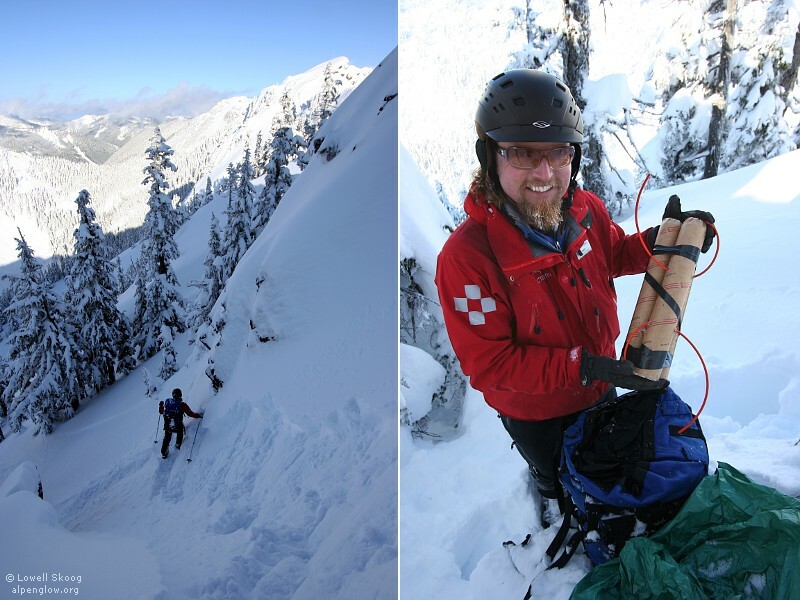 We started with the 50 lb bags they use to rattle the cliffs above the lower half of the ski area, moved on to some much needed ski cutting below Elevator Gate, and finished with a successful cornice mission. A fantastic way to spend a day. Our cornice was out near Corry's Couloir, a little before Piss Pass above the traverse.� Does anyone have a picture of Corry? Apparently she was pretty good looking, and a pretty quick study when it came to skiing too (lots of good stories all day long). And I have to add that while we were standing there waiting for the cornice to drop, at least 4 guys ducked the rope behind us. They turned around when they saw the line of about 7 red jackets just around the corner, waiting at the top of the traverse. Good for them, considering what was about to happen. Hope you enjoy the quick video of your handiwork. Great report. We were at the base area watching the show before heading out to Pineapple Pass. A couple of the charges knocked the cornices off the bears in the base area. Awesome!! Saw you guys up there. Great views. Shout out to Stimbuck and the Alpy Pro Patrol. Thanks for all the hard work! I got to take one of the companion rescue courses with Pro Patrol. The courses couldn't have been taught any better.